Strawberry, one of our most delicious, nectarean fruit is growing ripe these days. It may be grown successfully in a separated part of the vegetable garden or in a simple pot, as its demand for place is quite simple. If we plant purchased seedlings or strong sprouts derived from the stems of strawberry bed at the beginning of autumn, then we may harvest the flavourful fruit as early as the following spring. However, I do not want to share tricks of the trades how to produce excellent strawberry, but how to preserve it in three different ways. A lot of people ask how to bottle strawberry in a way that fruits remain a whole. 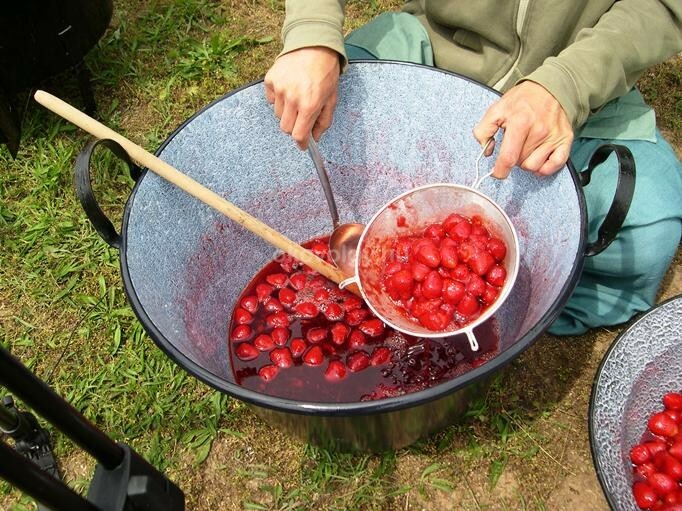 Strawberry preserve is a highly attractive and tasteful food, and in wintertime it may be used in various ways. Moreover, it may be consumed just in itself. Besides practices of making a strawberry preserve, I will share the method and recipe of strawberry syrup and jam of Krishna Valley. 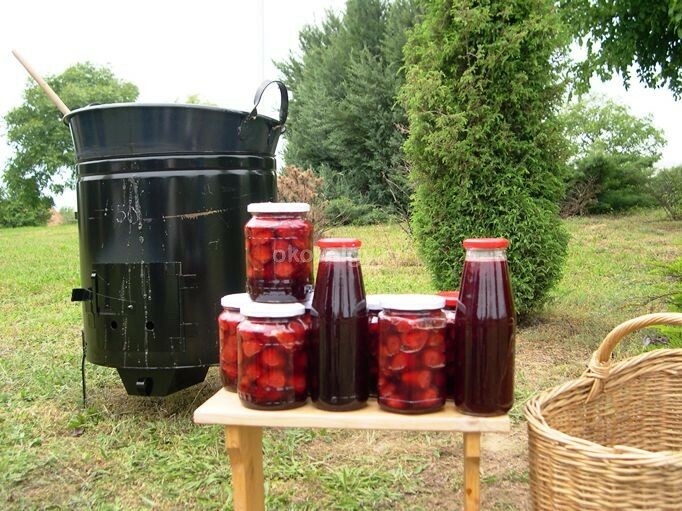 A few days ago we took a short film on the procedure of strawberry preserving. (You may watch it soon on our homepage!) I will show the procedure through the photos that were taken during the shooting. 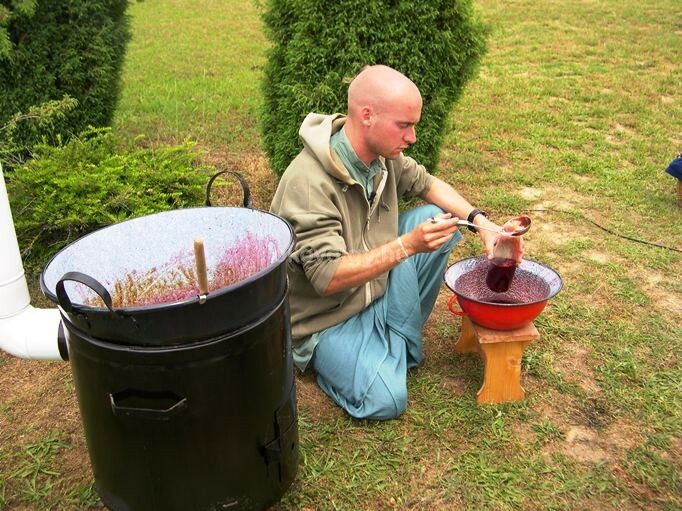 On the photos you may see our friend, Bala-modaka dasa (Balázs Antal) from Krishna Valley, who is the Head of Gardening, and who helped us demonstrate the various stages of preserving. After the snapshots you may read the above-mentioned three recipes. 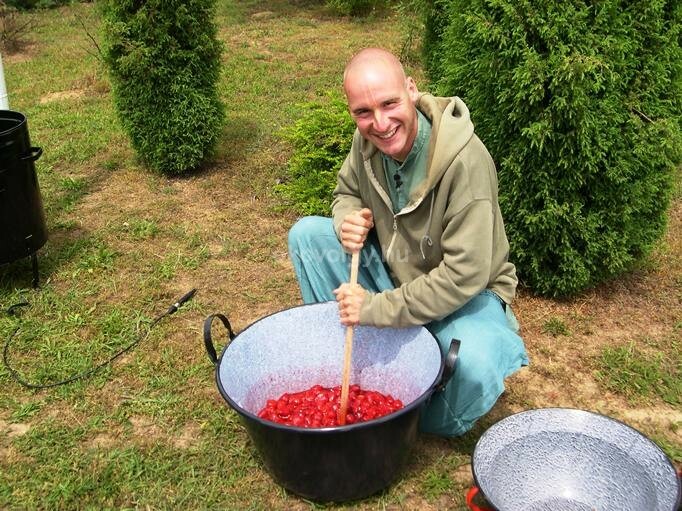 We clean the strawberry, and then soak it into sugar for a day. In this way it gives its juice off. We take apart the fruit and its juice. After that we boil the juice for 10 minutes and skim the foam. If the juice cools down, we pour it back onto the fruit. We repeat the procedure in the next two days. On the third day we add the fruit to the liquid during boiling and boil them together for a few minutes. At this stage we put the hot preserve into clean jars, seal them tightly and wrap them into dry clothes, so that they cool down gradually. After the jars cool down, we take them out of the wrapping, and put them into cool, dry place. 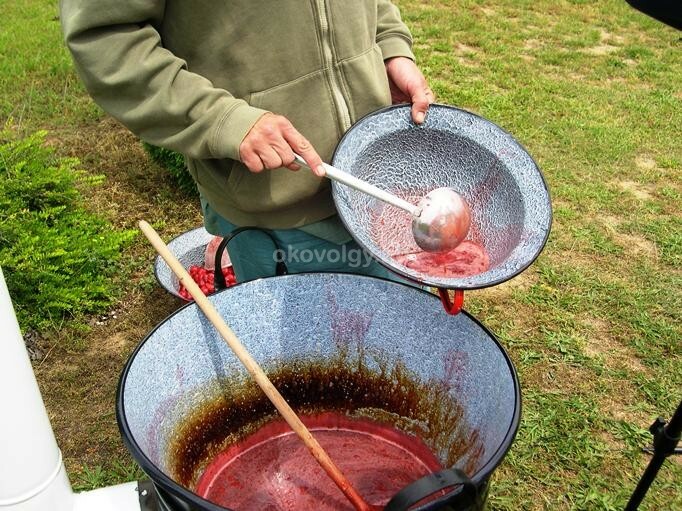 There is a similar procedure to make strawberry syrup as well; see the recipe below. Results of our three-day work: strawberry preserve and strawberry syrup. It is a wonderful winter delicacy, and it is surely a magnificent gift, too. Remove the stalk and wash the strawberry properly, after then put it in a dish and add sugar to it. (You need one third of sugar to a unit of strawberry; i.e. to 1 kg of strawberry, you need to add 30 dkgs of sugar). Leave it like that for a day, then filter the juice and boil that for 10 minutes. Skim the foam simultaneously. If the juice cools down, pour it back onto the strawberry. Repeat the same procedure on the second day. On the third day boil the juice again, add the strawberries to it and boil it together for a couple of minutes. Afterwards put the strawberries in jars, seal them tightly and wrap them into dry clothes, so that they cool down gradually. Add 20 dkgs of sugar to each liter of strawberry juice that has remained after the preservation of strawberry. Boil this syrup, then pour them into bottles and wrap them into dry clothes. Wash and clean the strawberry, then pound it. After start cooking it and when it is on the boil add sugar to it. Add 40 dkgs of sugar to a kg of strawberry. From the point of boiling cook it for 20-25 minutes, then put it into jars and seal them. Sterilize it by putting the jars in dry clothes.